After a few minutes on the Aakash, a five-year-old American kid proudly announced he had achieved Level 4 in an addition game. He’d started the day at Level 1. These poorer kids in North Carolina were already picking up skills they’d be learning in the next school year, which was unprecedented – they would usually start off the year at a disadvantage. 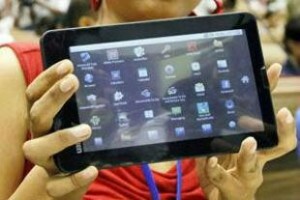 The world’s cheapest Made-in-India tablet, nicknamed Aakash (sky), had promised to transform Indian education. Instead, the government project got mired in delays and controversies in India. Meanwhile, the $50 Aakash tablet was creating a buzz in a dozen countries, and in the United Nations, where it was showcased last November. Now, the Aakash has just completed a pilot in the US state of North Carolina, with 100 units of the Android tablets deployed in summer camps for poorer schoolchildren (mostly under age 10) to help them prepare for next year’s studies. And there are other projects under way, with 2,000 tablets – DataWind’s Aakash-equivalent UbiSlate models – already deployed. Wadhwa is an evangelist for low-cost tablets. He has written extensively in the Washington Post, ForeignPolicy.com, and elsewhere, about their potential to transform education. He also saw the Aakash “as a way to force US tablet prices to drop – bring in some competition from abroad”. Along the way, Wadhwa spoke about the Aakash to Lotus Corp founder Mitch Kapor, Obama’s former CTO Aneesh Chopra, and to others including Evans, to bring them on board for different projects involving the low-cost tablets. The tablets in the pilot shipped with apps mostly developed by New York-based Mango Learning, an educational games venture. Mango’s chairman Prakesh Ahuja offered access to their entire suite of apps, including a management and evaluation system that tracks student progress. The sub-$50 price of the Wi-fi was a game-changer, Evans says, adding that free wi-fi was available in many of the students’ neighbourhoods. “We discussed giving the tablets to the students for the pilot, but the staff preferred to keep possession of them to make sure they stayed configured consistently,” adding that several parents now want to buy the tablet–even though they all live on public aid. The Aakash, which costs about $50, was designed and developed by London-based DataWind for India’s ministries of human resource development (HRD) and information and communication technology (ICT). About 100,000 units were supplied in the first phase, ending in April 2013, mostly in the form of Aakash 2, a tablet well received even by critics who had panned the first Aakash. Initially meant for engineering college students at a subsidized $35, the Aakash was to be later given to other students – with ambitious plans of giving them to all 220 million students in India over seven to eight years. That rollout is now planned for 2014, with what the Indian government now calls Aakash 4. MoArmouz launches Embossed Neoprene Sleeve – an ideal product that fits all parameters of style and quality!